Everyone goes through hard times and struggles. Think of your favorite musician. Think of your favorite actor. Even think of your best friend. We all need a little help sometimes, and it takes courage to admit it. Getting the help you need will enable you to learn to better yourself and find balance in your life. College is a fresh start and a time for self-discovery. But it can also be overwhelming and scary as you try to fit in to the college environment. Are you nervous and stressed about your first year of college? Are you having trouble dealing with your college roommate? Do you feel lost and alone on campus? Do you feel overwhelmed with assignments? If you've answered "YES!" to any of the above questions, you're not alone. 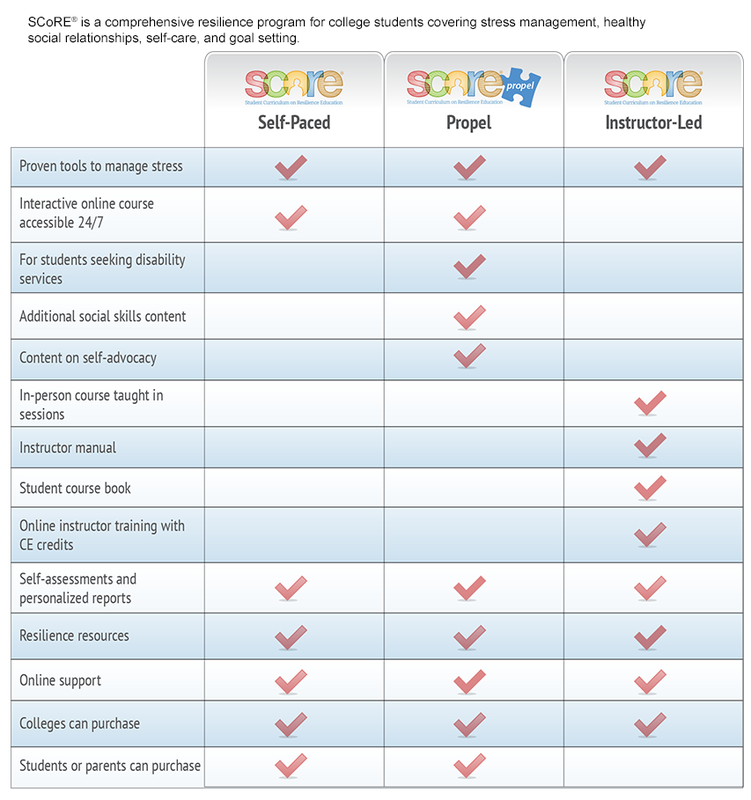 SCoRE® – the Student Curriculum on Resilience Education® – has helped many students deal with these kinds of struggles. Resilience? What's that? And how can SCoRE help? It all comes down to resilience – the ability to adjust to circumstances and keep going in the face of adversity. Imagine having the key strategies you need to succeed in college and reach your goals. With SCoRE, you will! Set yourself up for success with the SCoRE self-paced course – just $19.95 for lifetime access. Ready to purchase? Get started. "I used to be under so much pressure I would cry myself to sleep. I now take it one step at a time and do exercises to reduce the stress. The problems that seemed so big before seem like nothing to me now. It's a great feeling." "I'm better able to handle daily stressors by thinking in different ways and taking purposeful breaks." "SCoRE changed my view on stress – now, instead of viewing stress negatively, I see it as an indicator that I need to change my habits into more efficient work methods." "I felt like I had lost my drive and motivation to want to stay in school. I also faced difficulties with the decision to change my major. I felt lost and alone as if I did not have people that I could turn to. This was until the first day that I had my resiliency class ... Every week, I looked forward to going to this class because of the way it helped me to escape. During this time, I have learned to cope with my stress and to stay on a positive track in my life." "Sometimes you get a bad grade; sometimes you fight with your roommate ... These unfortunate events are not what defines you. What defines you is how you react to these situations, how you choose to confront these situations, and what you do because of these situations. SCoRE not only taught me the definition of 'resilient' but how to apply resilience skills to my everyday life." "When I was stressing over my biology exam, I took a fifteen-minute purposeful break from studying and then began to study again on a much calmer level."